Lately I’ve been walking the dogs a lot... and it's completely changed my outlook on life. Lately I’ve been walking the dogs a lot. We generally share it around but of late, I’ve been the only one home in daylight hours, and the dogs get a bit edgy when they aren’t walked regularly. It’s given me a lot of time to disconnect and think… and I’ve learnt a lot about habits from the boys. 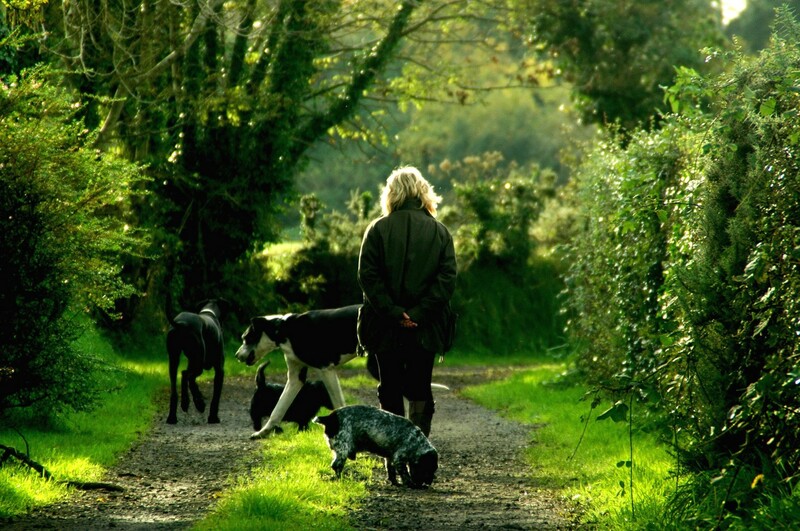 When walking, there’s a few routes we take regularly; a short walk where we throw a toy so the dogs get to run, a medium walk in a sheltered area for windy days; and a long walk in the woods that’s reserved for weekends. Recently, we went out for a walk and I spotted a forgotten path which I hadn’t walked down since it was warm (it’s been months). A quick thought of ‘let’s explore’ and we were off on a new adventure. Before we talk about the new path though, I want to tell you about the routine when we take the regular routes. I’m sure you get the gist… the routine is the same every day, sniffing and urinating in the same places so they can be “top dog” until the next dog comes along… and all of this happens before we even choose which way we’re walking! Back to the fork in the road, and we turned right, instead of the usual left. Immediately, both noses went straight to the ground. The well-behaved puppies who normally walk beside me in a straight line… they were nowhere to be found. One dog went one way, the other dog went the opposite. It was clear we’d just ventured into a whole new world and any ‘puppy norms’ went out the window. Oh, except the peeing on all the bushes… that still happened A LOT! So we walked for about 45 minutes, and all the while, their noses never moved further than an inch from the ground. They followed every exciting scent, found new places to do their business, and ate whatever they could find (even if it wasn’t technically edible). As we walked, I observed this behaviour and pondered how such a small change sparked such a significant reaction in these animals. Simply by changing the direction of our walk, I’d overwhelmed their senses, and the dogs reacted accordingly. It made me wonder if, without even thinking, we’d conditioned them follow our routine. It made me consider whether, through imparting our routine upon them, we’d prompted them to build their own list of habits. Worse than this, it made me question if we’d impacted upon their quality of life because our comfortable routine takes so many opportunities away from them. It also made contemplate if, as creatures of habit, we’re subconsciously limiting our own opportunities as well. Are our habits healthy or unhealthy? For the dogs I realised that, while a walk is healthy, walking somewhere new creates a lot better experience for them. Are you living a life of habit; a life that’s alright, but not very exciting? If so, what habits are you maintaining that perpetuate your average life? Do you order take away every Friday because it’s routine, not because you really feel like a pizza? Do you walk in the door, fall onto the lounge, then not move until bed because that’s what you always do? Do you spend all weekend cleaning the house, mowing the lawn and tidying the garden, because that’s what weekends are for? What are you doing in your life that limits you, makes you unhappy or prevents personal growth? These things are the building blocks of your unhappy, unhealthy life. What habits could you change to turn right and head down an exciting new path, today?